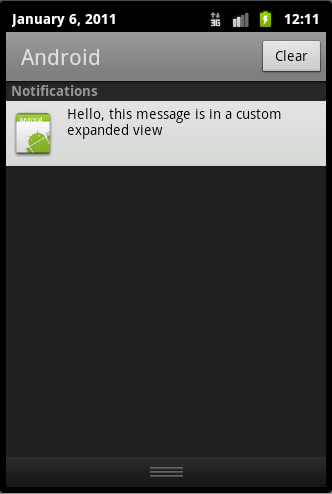 For notifying users with dialog, We will create an object of dialog. In this, I am removing the title using requestWindowFeature(Window.FEATURE_NO_TITLE) and adding a layout to the dialog to it using addContentView(). Second one is toast, that will flash and will display for a predefined period either as, Toast.LENGTH_SHORT or Toast.LENGTH_LONG. 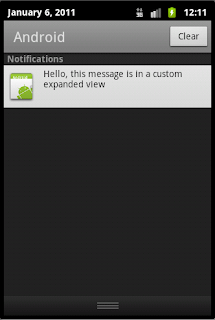 Third one is notification, to notify user, about any background activity is started. In notification, itself different forms are there. - when we click on the notification, it will take us to a new activity. For this, in pendingIntent, for the intent object, specify the acitivity, that we want to go. We are opening the gallery as a sub activity of our application, because onActivityResult() will get called after selecting the image from gallery. So in onACtivityResult(), we will get the Uri of the selected image and from Mediastore contentprovider, we can get the selected image as bitmap. After that, for showing it in the application, just setting the image in a ImageView. -To do some particular actions in every time interval. As specified in Android developer site, we will use AlarmManager, when we need to do some actions, even if our application is not running. For normal timing operations use handlers.